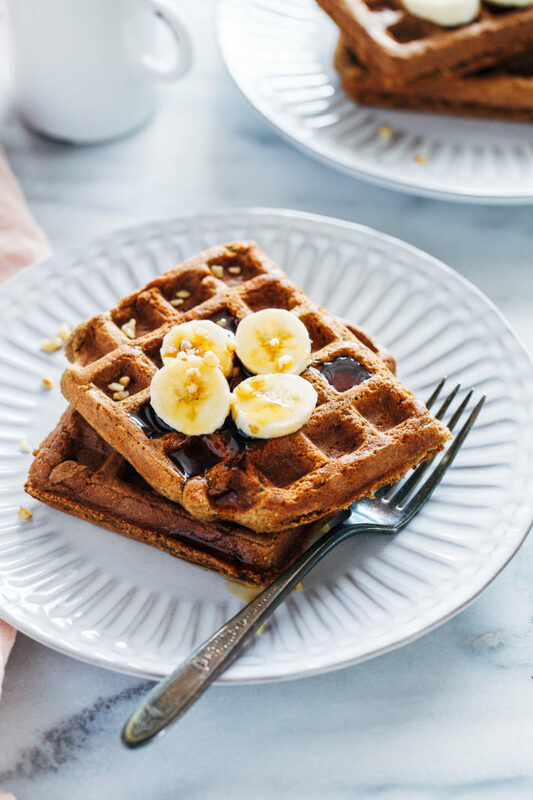 Flourless Vegan Banana Bread Waffles- made easy in a blender, these gluten-free waffles are naturally sweetened and full of flavor. They freeze well too, making them perfect to prep for weekday mornings! Apparently Valentine’s Day is coming up next week. How could we forget, right? The media reminds us every 10 seconds. I’m not one to expect gifts but Brandon knows the way to my heart usually involves something of the edible variety. Chocolate always impresses but if you really want to sweep me off my feet, serve me breakfast. I’m telling ya, there’s not much better than waking up to my favorite meal of the day already prepared for me. Unless it comes with a mimosa, of course. 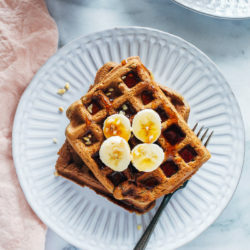 The base of this recipe is certified gluten-free rolled oats which I got from Nuts.com, an online bulk store that carries pretty much everything you can imagine. 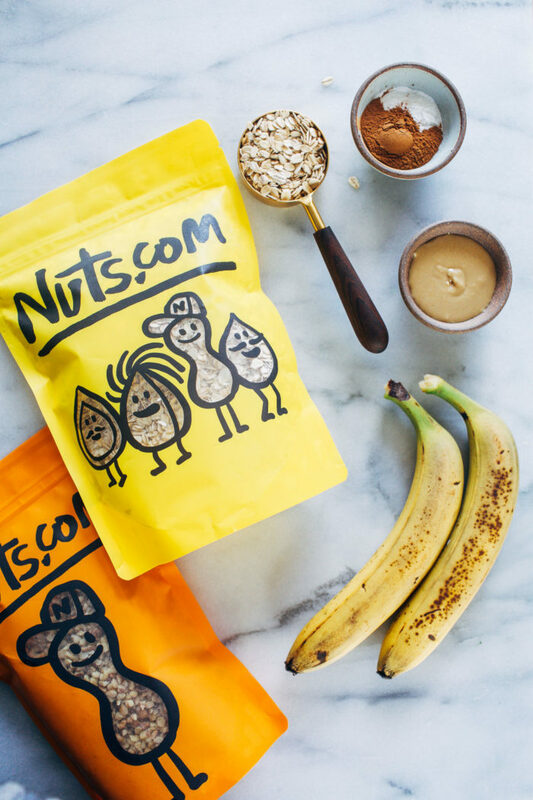 From nuts to seeds, dried fruit, candy, flours, snacks and coffee, they make it easy to restock your pantry with healthy ingredients and indulgent treats from the comfort of your own home. They’re a family business that values high quality and service, and I’m excited to be partnering with them this year. 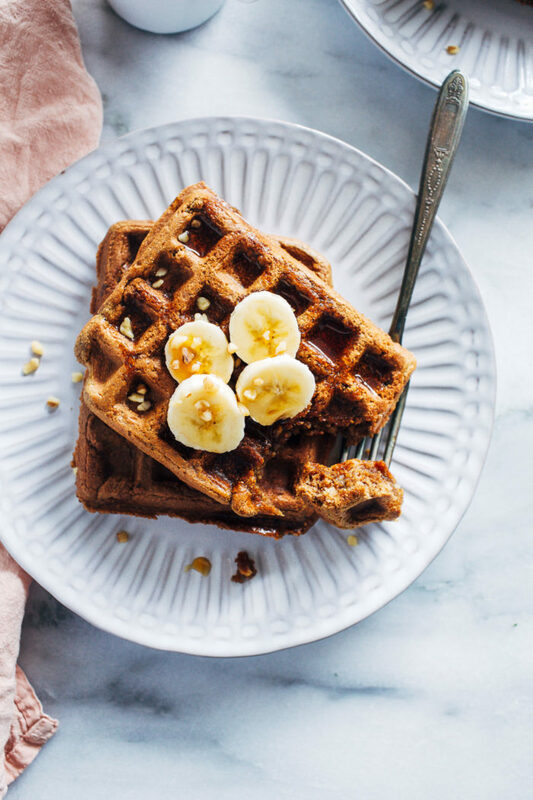 In addition to their oats, I also stirred in some of their chopped walnuts for a little extra texture and it made for one incredible batch of waffles. They’re dense with crispy edges and a lightly sweet flavor that will keep ’em coming back for more. I personally love walnuts in my banana bread but you could also add pecans, raisins, dark chocolate chips…whatever floats your banana boat. 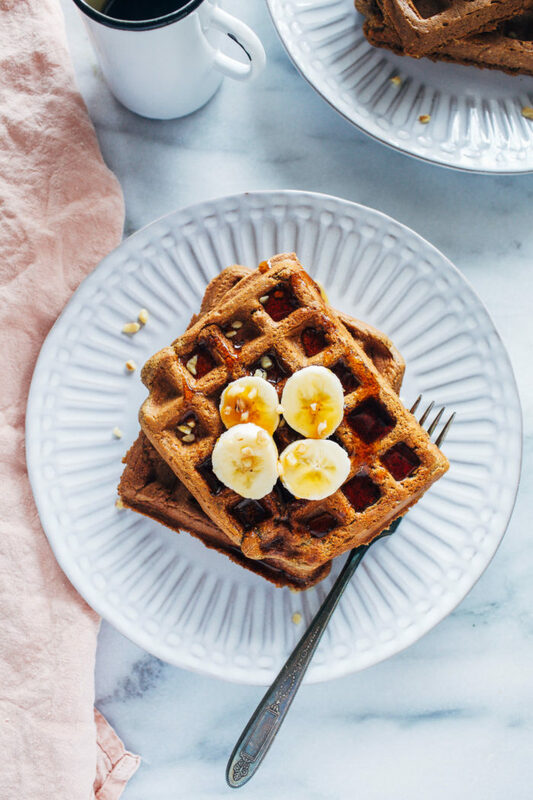 Last tip before I go, I wrote this recipe to make a large batch because these waffles freeze beautifully. Just allow them to cool to room temperature then place them in a sealed container and freeze for up to 2 months. Depending on your waffle maker they can be reheated in the toaster too. I recently bought this one because my old waffle maker made them too large to fit in my toaster. I know, first world problems. But I highly recommend the waffle maker I have now if you’re looking for one! Preheat your waffle iron. In a measuring cup, combine the almond milk and apple cider vinegar. Layer all ingredients in a blender in the order listed. It’s very important to put the wet ingredients on the bottom for proper blending. Blend on high until smooth, for about 10 seconds. If you’d like to add nuts or chocolate chips, stir them in by hand now. 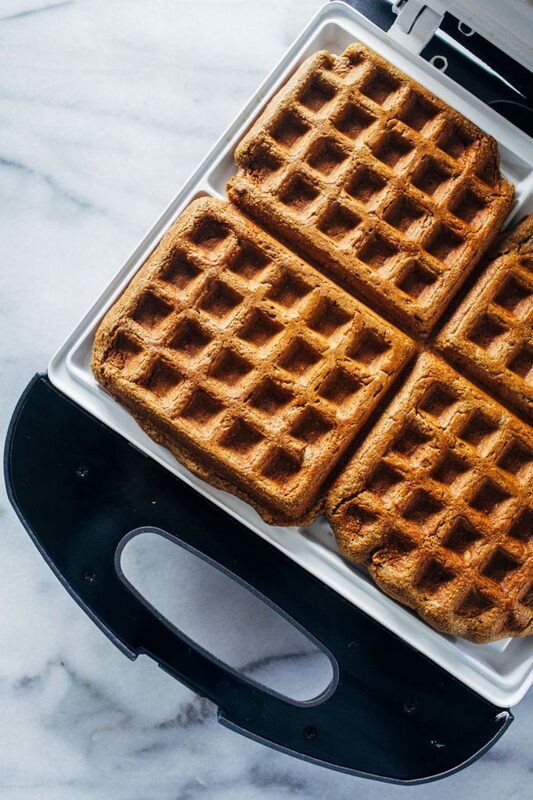 Pour the batter into the waffle iron and cook until crispy on the edges, about 10 minutes. Remove from iron and set aside to cool for a few minutes. 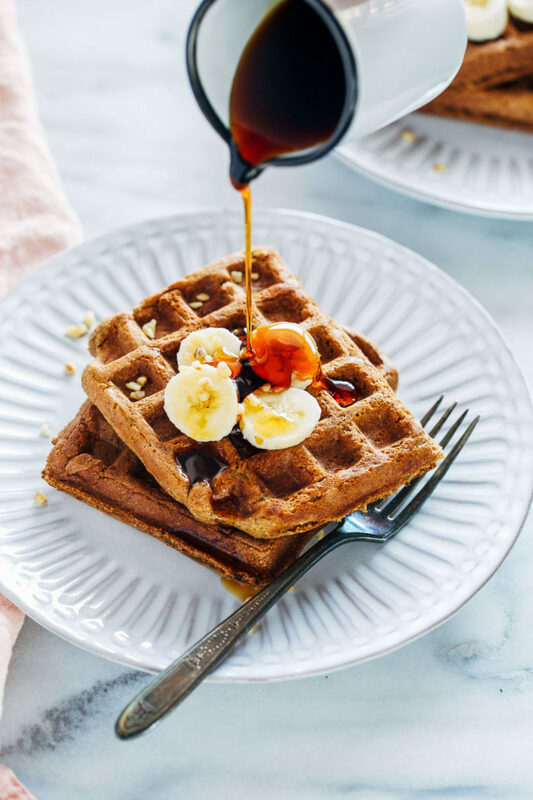 Serve warm with pure maple syrup and enjoy! *Any kind of drippy nut butter will work. You can also substitute oil if you’re not eating oil-free. **Be sure to use certified gluten-free oats for allergies. These waffles freeze beautifully. Allow them to cool to room temperature then place them in a sealed container and freeze for up to 2 months. Depending on your waffle maker, they can be reheated in the toaster.